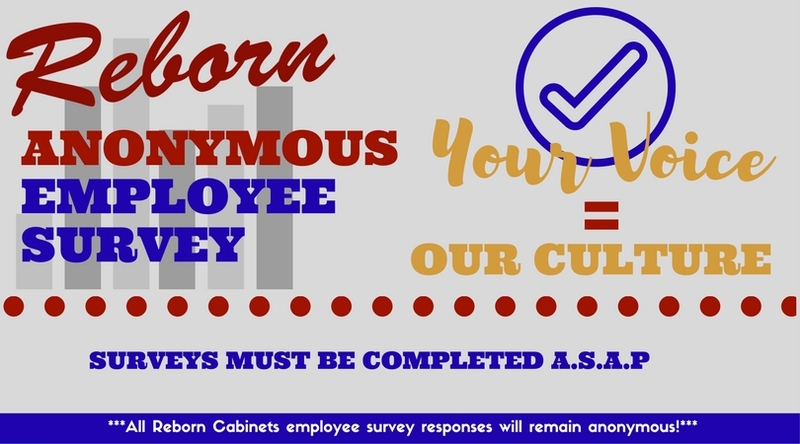 We are asking once again for everyone to participate in the Reborn Cabinets 2017 Anonymous Employee Survey! Getting honest feedback is the key to fostering a healthy culture here at Reborn. Your suggestions for how we can improve as a company will add great value to the workplace and your work life satisfaction. The Leadership Team at Reborn is excited to make informed and proactive changes that will allow our #1 asset to thrive—OUR PEOPLE!!! We strongly encourage you to participate in our survey simply by clicking below!